projeqt \ how great stories are told from projeqt on Vimeo. With the advent of Twitter, Facebook and similar sites, it seems that “social media” is the new buzzword for today’s media professionals. That being said, social media is not some magic wand that casts a spell over unassuming audiences (then it would be called propaganda). Likewise, many new to the field think that if they start up a “social media” company they will be marketing geniuses and multimillionaires overnight. News flash – that simply isn’t true. Yes, social media is a powerful tool to get messages out to vast audiences. However, the way that said messages are framed and communicated makes a big difference in overall effectiveness. Not all communication works, but in the case of social media, your best bet is making sure that any and all communication is strategic in nature. If I ‘Tweet’ something, everyone will see it. It doesn’t matter if it seems inappropriate or out of place, I can always delete it later (remember: once it’s online, there it will stay). Facebook / Twitter / Linkedin accounts are seperate (this might be true, but the site will often automatically link them based on names and interests). If I’m hosting a large event, all I need to do is make a Facebook event and everyone will come. Social media is a one-way conversation. All of the above are untrue the majority of the time. Check out www.zombiejournalism.com for more insight on how to properly network using social media tools. Anita McBride, former chief of staff for first lady Laura Bush, participated in a C-SPAN distance learning video conference on April 14. McBride spoke about her extensive knowledge on many first ladies of American history and took questions from Steve Scully, the political editor for the C-SPAN networks, George Mason University, University of Denver and Purdue University. McBride talked about her work with the U.S.-Afghan Women’s Council and other programs like the Middle East Partnership Initiative (MEPI) that help women in those countries involve themselves in the political process or other male-dominated aspects that they’ve been denied from. I was really happy I asked McBride a question and her answers were very honest. Many people in my class were nervous about asking questions and I was, too. I’m normally not interested in political journalism but this conference has made me want to try it out. Summary: In an effort to fight erroneous search results resulting from black hate SEO tactics, Google’s new update utilizes user feedback to rate the quality of search results. Google released its new weapon to fight content-farmers in February which it applied on April11 to all its English language searches. According to Google’s Webmaster Central blog, “Panda” has affected two percent of search inquiries. The new algorithm by Google utilizes user feedback, including what users choose to block from their search results. However, this is prone to manipulation if a quality site is maliciously blocked by competing sites. Countering this, Google has introduced quality guidelines to help websites who may suffer negatively by the update. Summary: The former chief of staff to Laura Bush talks about First Ladies in U.S. history, her work with the women of Afghanistan, which First Lady in history she would like to meet, and why Planned Parenthood is not safe from cuts in the federal budget. Former Chief of Staff to Laura Bush, Anita McBride is “deeply involved with issues of women,” but believes that when it comes to cutting funding for Planned Parenthood, everything should be on the table. McBride, who is an an advocate for women’s issues in Afghanistan, avoided giving her personal opinion about congressional republicans attempt to halt federal funding to the non-profit that officers reproductive and health care services. “Everything needs to be looked at and everything has to share in the sacrifice,” McBride said. Her comments came during an April 14 C-SPAN interview with senior executive producer and political editor Steve Scully and students from George Mason University, Purdue University and the University of Denver. However, McBride did provide her perspective on the office of the First Lady. “It is the most demanding unpaid job,” she said, and possesses “challenges that are unique to the First Lady and her staff.” While the First Lady has the ability to pick and choose the issues she wants to focus on, she is also at risk of being drawn into a larger national debate. When asked which First Lady which would have liked to work under, McBride gave two names. McBride also finds the story of Abigail Addams intriguing. 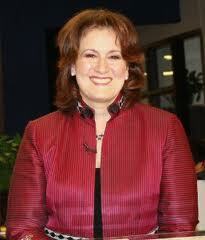 Anita McBride career in began in 1984 when she joined the Reagan administration. From 1987 to 1992, she was Director of White House Personnel under Presidents Reagan and George H. W. Bush. She was a member of the U.S. delegation for the U.N. Commission on the Status of Women in 2002 and the Commission of Human Rights in 2003. From 2005-2009, she served as Assistant to President George W. Bush and Chief of Staff to First Lady Laura Bush. Currently McBride is a chair on the William J. Fulbright Foreign Scholarship Board, a member on the U.S.-Afghan Women’s Council and a consultant for the executive service firm Global Political Strategies. 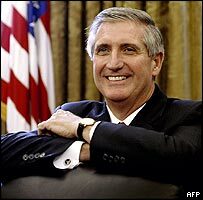 This was how Andrew Card answered the first question of , “What did you think about the Bush administration?” during the C-SPAN video conference. On April 7 Card joined Steve Scully, political editor for the C-SPAN networks, and participating students from George Mason University, Purdue University and the University of Denver for a live video conference. Card, who is the former chief of staff for George W. Bush, had a lot of insight on the inner workings and difficult jobs he faced over his six years in this position. He explained his thought process in choosing what exactly to say to the president. 1) He asked himself “Does the president need to know?” 2) Make sure his statement wouldn’t elicit a question. He talked about how this was an unprecedented moment and how it was extremely rare to interrupt the President during an event, as he was speaking to second graders at Emma E. Booker Elementary School in Sarasota County, FL. “I was cool, calm, collected and objective on 9/11. I tried to not let my emotions take over me and focus on the job at hand,” said Card. He talked about how this was the day that changed him and President Bush forever. It made him grounded and put a new focus on his faith. At his desk by 5:30 a.m.
First document he read everyday was the Presidents Daily Brief, which is one of the most secret documents. Read economic and domestic news. He got to greet the President every morning and tell him his agenda. When asked about the challenges of his job, he simply chuckled with, “Giving information to the President”. He then went on to explain that he had to “give him everything he needs, but not necessarily what he wants.” Card explained how he always ensured that he gave President Bush the time he needed to be prepared to make a decision. All the information he had and knew. The fact that he knew more than the President. The scary and serious information he was given. Knowing that the enemy is real and that they plot and create danger. 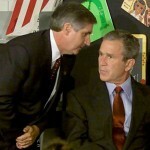 Card explained how he obviously had to maintain a professional relationship with President Bush. He actually said to Bush that, “As long as I’m your Chief of Staff, I can’t be your friend.” He had to find the right balance and know that this relationship would lead way to a wonderful friendship in the future. He ended things off my explaining how Bush Senior and former President Bill Clinton have become good friends. “Bush Senior is an good listener, Clinton is a good talker, and you put the two together and there’s a great friendship,” said Card. As for Card, he now has that wonderful friendship with former President Bush and the experience of a lifetime to take with him. The distance learning course, which is produced by C-SPAN, is a unique opportunity for students to interview guests via video conference. The course airs on C-SPAN3 on Fridays at 5 p.m. and also streams online here. Anita McBride knows First Ladies. She knows their causes, roles, challenges, and duties. She knows the difference of what they can do and what they should do. McBride is a veteran at the White House. She has worked for three first ladies — last one being Laura Bush — and has seen the presidential transitioning from inside the White House. Our class got a change to talk to McBride on a C-SPAN conference on April 14. McBride talked about the role of First Ladies, the White House as a home, women’s in the Middle Eastern, among other topics. McBride explained to us that the role of the First Lady is defined by the First Lady herself. The modern First Lady is expected to engage on social issues and have a voice. Her role was limited to hostess a couple of decades ago. Now they usually engage in issues they feel strong about based on their experiences. After she pick and choose her issues, the First Lady has to put herself out there with the support of her staff and reliable outlets. McBride explained the First Lady position is not paid, but her staff is. It also fascinating to understand how McBride and her staff emphasize the idea of having a normal family life at the White House. McBride talked about how the White House staff supports every presidential family that has ever lived in the house. 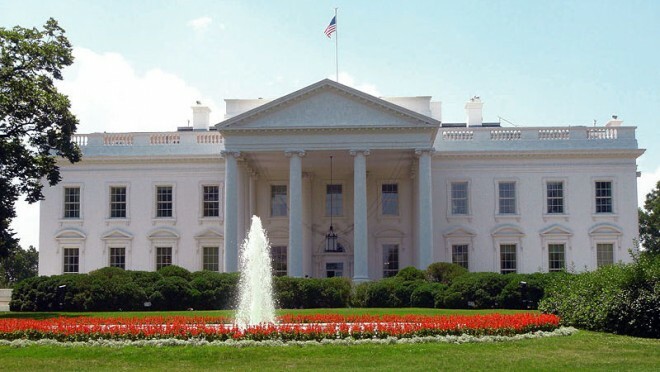 The White House is a symbol of democracy, but also a home for a family. After watching a video of Obama talking about his “traditional family life” at the White House, McBride affirms to be glad to hear that and reaffirms the idea of the most powerful house in the country as a home. McBride also talked about the fact First Ladies humanize the presidents. It makes the public understand that they are also human. They are husband and wife, man and woman, just like everybody else. Two videos presented during the discussion emphasized the humanization of the presidents. After watching videos and talking about main tragic events, McBride talked about Laura Bush’s experience with 9/11. She told us how Laura Bush was hosting a picnic on that morning and how they news affected her and her family. Her story made us see the president as human, with fears and guts. The video conference with Andrew Card, the former chief of staff for George W. Bush, was an experience that doesn’t come too often. It isn’t common for people to be a part of a video conference with someone that used to be high up in The White House, so this should be treasured for a long time. In the conference, Card discussed his tenure with Bush, mostly focusing on the tragedy of September 11, 2001, and also discussed how he got into politics, the war in Iraq and today’s American government. 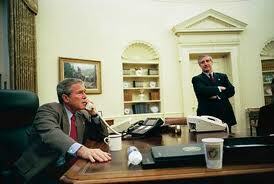 Card was Bush’s chief of staff from 2000-2006, and basically his “main man” and “go to guy” in times of trouble. As the chief of staff, Card had to face probably the biggest challenge of his life. 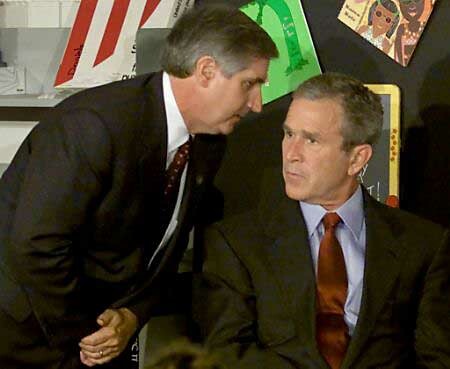 That was to inform the president that the towers went down in the World Trade Center. It was also very rare for a president to be interrupted during an event, as Bush was in an elementary school, reading to some students. Over Bush’s eight years, there has been plenty of criticism from both sides on how he and his staff handled things in The White House. Plenty of the criticism circled around the war in Iraq. Card believed that, over time, people will start to understand their decisions. Card also went over what Bush’s plan was within his first nine months of being president. Bush’s main focus was education, as he and his staff helped create the Leave No Child Behind Act. There was also the initial challenge of what to do with healthcare and economics. Card had plenty on his plate while chief of staff for George W. Bush. No matter what the obstacles were he had to face, he believed it was the he and the president’s job to, “Preserve, protect and defend” and do what he believed was right to help make our country stronger.